Create sacred space by using this beautiful clergy stole and altar cloth of purple and gold. Together they will adorn any interfaith ceremony or celebration! 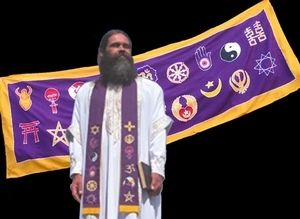 The clergy stole is 4” x 6’ long, made of cotton and is appropriate for those who participate in interfaith gatherings. The twelve faiths represented are: Judaism, Islam, Tao, Jain, Buddhism, Baha’i, Christianity, Sikhism, African Goddess, Hinduism, Native American and Wiccan. The stunning purple/gold altar cloth which measures 30” x 80” can also be worn as a shawl or hung on the wall by using its dowel rod pocket across the top. This hand batiked rayon altar cloth includes 18 faiths: 12 listed above plus Great Goddess, Mayan, Confucian, Shinto, Zoroastrian and Sufi. Honor the many faiths of the world and share this beautiful clergy stole and altar cloth with someone special! The set makes a very unique gift. Note: if by chance you prefer the white or blue stole as part of this package, call our toll free number or e.mail us before you order to let us know your preference. Care instructions... The design for both items is Rayon handmade Batik produced by an expert Balinese artisan. The banner/altar cloth comes folded and any wrinkles can be removed with a delicate/cool setting iron. Our stoles are produced in Bali using Bak, a technique of wax-resistant dyeing applied to cloth. These items are parally or wholly made by hand from natural materials. Both items can be hand washed and line/hang drying is recommended.